Older flew with Smith and stayed on after the AVG's inception to the USAAF and became group operations officer and deputy commander of the 23rd FG flying P-51's. He had a career total of 18 confirmed and 5 probables. Leaving the Air Force as Lt. Col. after the war, Older obtained a law degree and became a superior court judge in Los Angeles, CA. and gained prominence as the presiding judge in the Charles Manson murder trial in 1970-71. This panel is painted in colors before they faded. 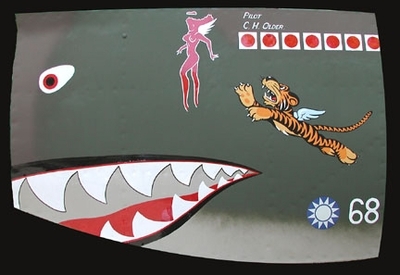 Note the girl emblem is different than Smith's AC and the 'shark' mouth varies as well. The Tiger decal has been faithfully reproduced. It is a popular misconception that they were painted on.